Mashad signed by Shisgalani, circa 1950: 12'2" x 9'7"
Size in feet12'2" x 9'7"
ConditionPre-Owned semi-antique in excellent condition. The city of Mashhad has long been one of the centres for production of famous Persian carpets. It is also one of the oldest centres of carpet weaving. The city is the capital of the province of Khorassan in north east Iran and it is located almost 900 kilometers to the north east of Tehran. 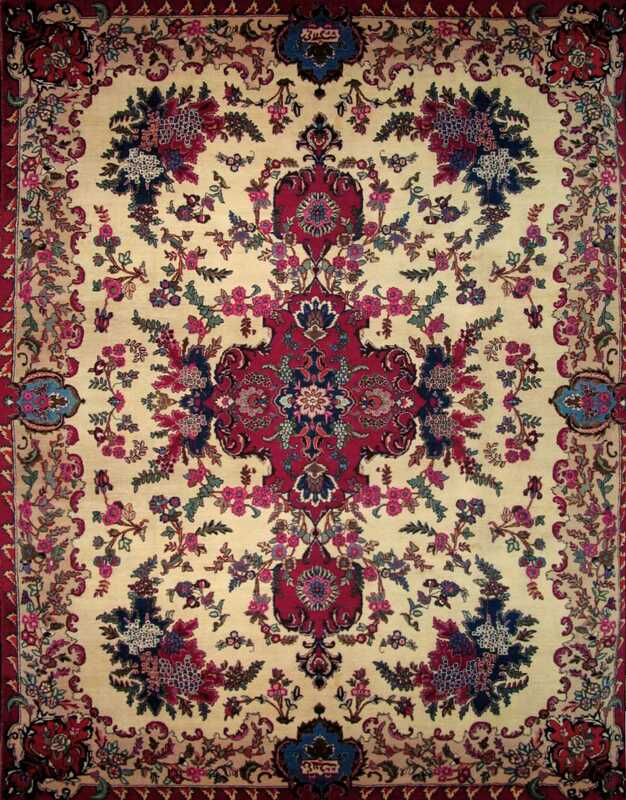 Carpet manufacturing is extensive in Mashhad. During the 16th and 17th centuries, Khorasan was one of the leading centers of weaving in Persia-- with carpets produced in workshops and villages throughout the province. After a period of decline at the beginning of the century, dealers from Tabriz (city in Iran) established a number of factories in the city and brought in weavers to work there. 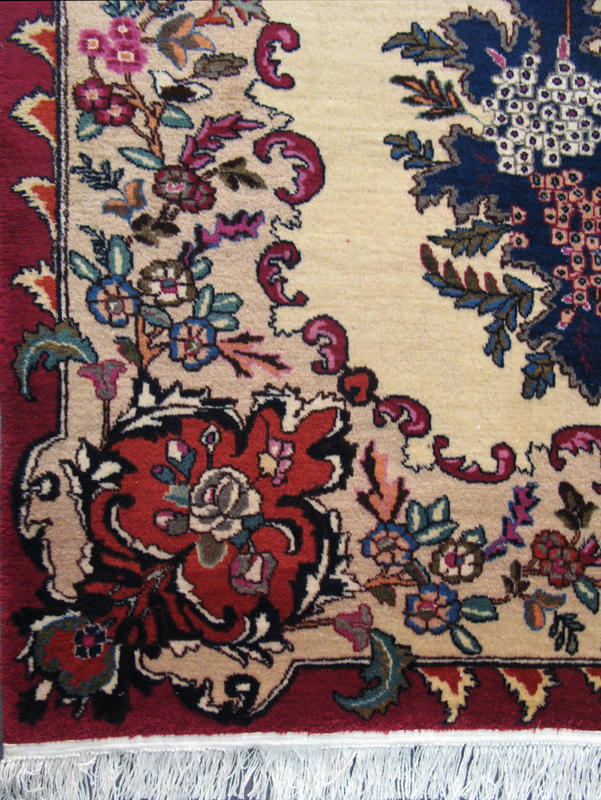 Since the local dealers used the Persian knot and the new weavers introduced the Turkish knot to the region, you can find both knot techniques in Mashad carpets. As an unusual practice, few rugs were woven and the city became known for its large and oversized carpets. Well-proportioned central medallion designs were very popular and were valued for their elegant curves and intricate arabesques. Most production today continues to be of large carpets with curvilinear designs and are also sold under the name Meshed. 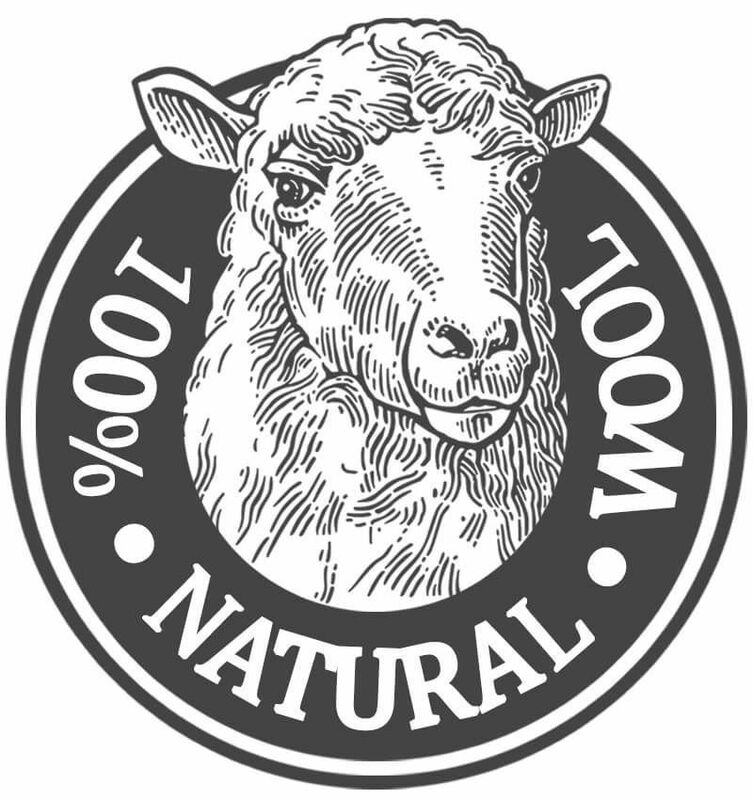 The wool from Khorasan is recognized by its softness. Their color schemes are usually tones of red or blue. These carpets are usually bright and cleverly colored therefore literally giving life to any dull room. Their foundations are mostly cotton. 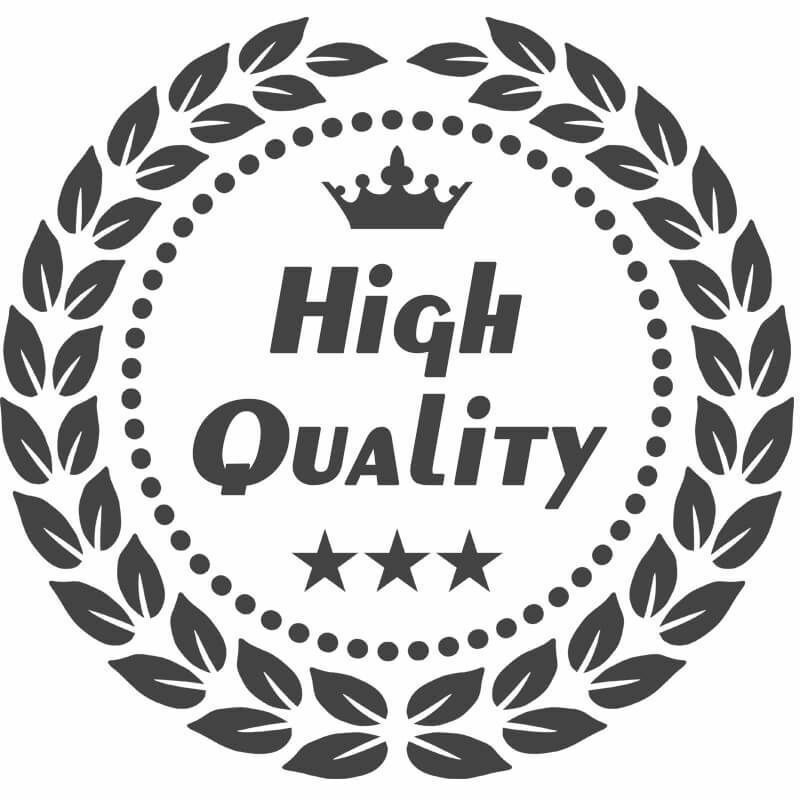 They are very well made and last a very long time. 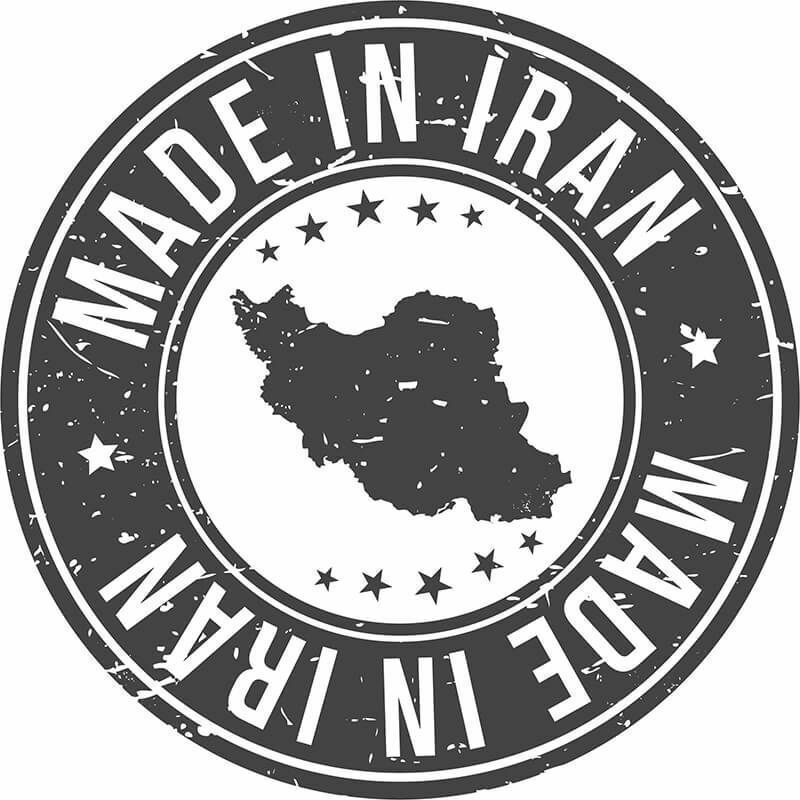 The United States enacted an embargo on all Iranian made products between 1986 and 1999. This included Iranian made Persian rugs. Washington had banned Persian carpets as part of sanctions against Iran in the past, but a goodwill gesture by the Clinton Administration in 2000 allowed imports of Iranian rugs. The rug loophole was closed however in September 2010. 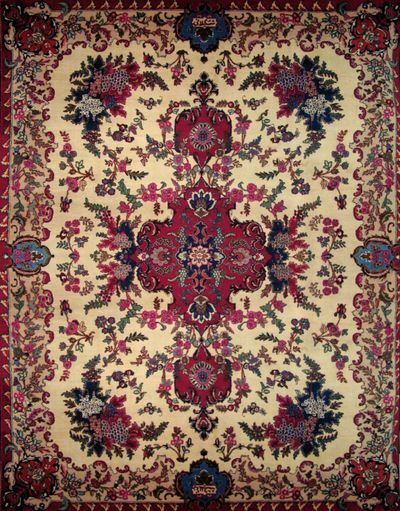 Unlike previous embargos, which caused a lot of rug sellers to smuggle the rugs through Canada, the latest embargo of 2010 is being thoroughly enforced my US and Canadian customs thus making Mashhad carpets a very rare and much sought after Persian rug. To learn more about iranian rugs, visit our Persian Rugs section. Sources and inspiration: B?rinstain, Val?rie, et al. L'art du tapis dans le monde (The art of carpets in the world). Paris: Meng?s, 1996. Print. ; Jerrehian Jr., Aram K.A. Oriental Rug Primer. Philadelphia: Running Press, 1980. Print. ; Herbert, Janice Summers. Oriental Rugs, New York: Macmillan, 1982. Print. ; Hackmack, Adolf. Chinese Carpets and Rugs, Rutland and Tokyo: Tuttle, 1980. Print. ; De Moubray, Amicia, and David Black. Carpets for the home, London: Laurence King Publishing, 1999. Print. ; Jacobsen, Charles. Oriental Rugs A Complete Guide, Rutland and Tokyo: Tuttle, 1962. Print. ; Bashir, S. (n.d.). Personal interview. ; Web site sources and dates of consultation vary (to be confirmed). Without prejudice to official usage. "Antique" refers to carpets at least 100 years old, whereas rugs between 50 and 99 years of age are classified as "semi-antique". Typically crafted with hand-spun wool and eco-friendly organic dyes, old carpets have a more luminous surface, creating an illusion of depth. Newer pieces are rarely able to capture the patina and character of an antique, which can add warmth to even the most pristine and minimalist spaces. Oriental & Persian carpet designs began to change at the turn of the 20th century, as Western influence expanded across the Middle East. The authenticity of the unique designs produced by local cultures declined with the introduction of larger-scale production that aimed to accommodate foreign tastes. Preserving the traditional techniques involved in the craft also became more challenging following the effects of the Industrial Revolution. Antique rugs are made of wool, cotton and silk. New rugs can be made from a variety of fibers, both natural and synthetic, including wool, cotton and silk, but also silk blends, faux silk (often called "Art Silk" or "artificial silk"), mercerized cotton and olefin. If a rug has signs of wear but still looks vibrant, this is an indication that it is a genuine antique. For insurance purposes, you should always obtain a certificate of authenticity from the dealer. This document should include the size, origin, age, style, materials, knot density, condition and estimated retail value of the carpet. 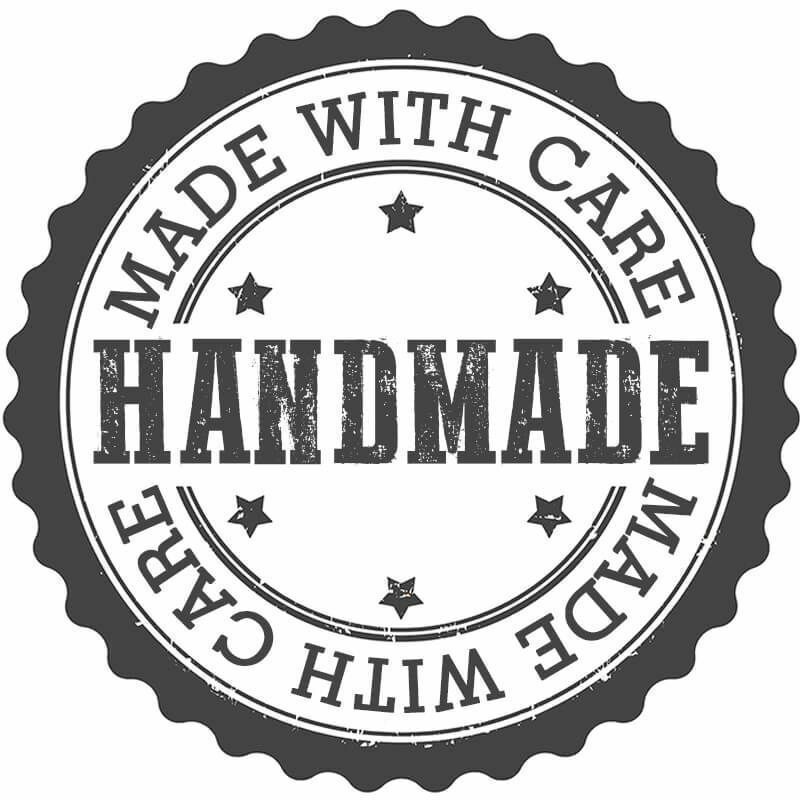 An authentic antique will not have a brand name associated with it, nor will it be hand-tufted.